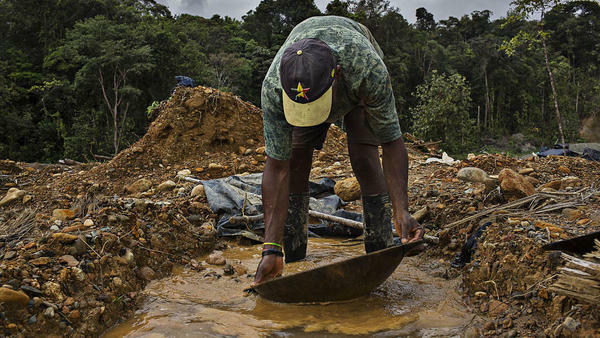 A person illegally pans for gold at a site in the Department of Choco near the city of Quibdo, Colombia, on Friday, Nov. 11, 2016. 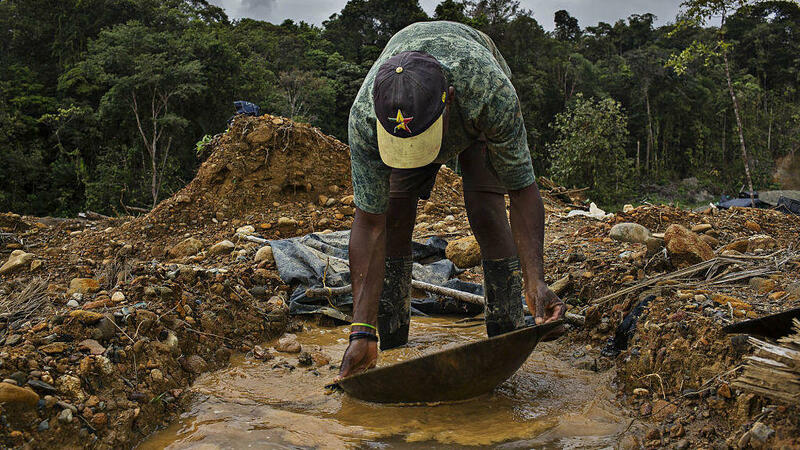 According to Santiago Angel, head of the Colombian mining association, about 85 percent of the 59 tons of gold produced last year in Colombia comes from operations without government licenses or environmental permits. We have a revelation this morning about how people spread disease. You've seen this happen - your co-worker gets sick and then you do. Well, this is a story about malaria, which is spread by mosquitoes. But in some places, it appears that the mosquitoes have help from human illegal activity. NPR's social science correspondent Shankar Vedantam is here with a story of crime and illness. Hi, Shankar. SHANKAR VEDANTAM, BYLINE: Hi, Steve. INSKEEP: Sounds like a newly discovered novel by Dostoyevsky, but go on. Go on. VEDANTAM: (Laughter) Well, this piece of social science research actually does read a little bit like the plot of a novel, Steve. I was speaking with Sandra Rozo. She's an economist at the University of Southern California. She told me that on visits to Colombia, she noticed newspaper stories that drew a connection between two very different things - illegal gold mines and malaria. INSKEEP: Illegal gold mines - what's happening here? VEDANTAM: Well, it turns out when miners are looking for gold in what are known as these alluvial deposits. What they do is they dig holes near rivers and then fill the holes with water. The idea is to get the gold, which is heavier than the dirt, to separate from the dirt. When the miners are done, they leave these pools of water behind and then go to the next location. INSKEEP: Oh, I can see where this might be going down. But we're talking about ordinary people doing this because they need some extra money. That's why it's illegal activity. OK.
VEDANTAM: Exactly, and of course, now when they leave these stagnant pools behind, that's exactly what the mosquitoes like to breed. And that's what ends up getting the malaria to spread. Now, this was a theory. What Rozo did was she obtained satellite data of illegal gold mines in Colombia and then matched the map of these mines with epidemiological data on the incidence of malaria in the country. SANDRA ROZO: What I find is that there is a large relationship between illegal gold mining and malaria incidence. This correlation is very, very, very, very large. INSKEEP: Correlation is very large, meaning if lots of people are digging lots of holes, filling them with water and leaving behind these stagnant pools, mosquitoes follow. VEDANTAM: That's right. Now, it's a correlation in that we're sort of looking at these two different things, illegal gold mines and malaria. It's possible that a third factor could be causing both of them. So, for example, if both are caused by poverty, for example - you have more illegal gold mines in poor areas, more malaria in poor areas - it might not be that the mines are actually causing the spread of malaria. So Sandra Rozo did a third thing - she found the geochemical distribution of gold in the country, where gold was more likely to occur. And she finds again that the places where gold is more likely to be found in Colombia are also the places where malaria is most likely to be spreading. INSKEEP: Oh, so it's not connected to poverty. It's connected to gold. VEDANTAM: It is connected to gold. And there's another factor here, Steve, which is the miners themselves because they're moving from place to place. When they get infected with malaria, they themselves might be serving as vectors of the disease. ROZO: These illegal miners tend to migrate a lot from one region to the other. So basically, when they deplete their gold in one region or in one area, they move to the next one. But when they move, they leave all these holes behind. But they also not only leave the holes, but if they had malaria, they propagate the virus in this new regions now because a new mosquito can bite them and spread the disease. VEDANTAM: Rozo thinks the same thing might actually be happening in other countries like Brazil and Indonesia. Basically, gold might be one of the unknown vectors for the spread of malaria. INSKEEP: Along with the people who mine it. Shankar, thanks very much. INSKEEP: That's NPR's Shankar Vedantam, who mines regularly for social science research nuggets and explores ideas about human behavior on his podcast, which is a kind of vector for those ideas, Hidden Brain. [POST-BROADCAST CORRECTION: During this report, malaria is referred to as a virus. In fact, the disease is caused by a parasite.] Transcript provided by NPR, Copyright NPR.